Microsoft announced its latest bit of game-changing tech at this year's E3, with Project Natal being the talk of the show. Indeed, TechRadar can't remember a new gaming technology that truly captured the imagination of gamers since Nintendo unveiled touch-control with DS back at E3 2004 and motion-control with Wii a year later in 2005. So read on – you'll learn the 10 essential things you need to know about Microsoft's game-changing Project Natal. It's pronounced nah-tahl – as in, it sounds a bit like tennis player Raphael Nadal and not at all like "antenatal" – this is key if you wish to avoid potential tech embarrassment when you are telling all your mates everything you're just about to learn about Microsoft's future games console in the pub tonight. 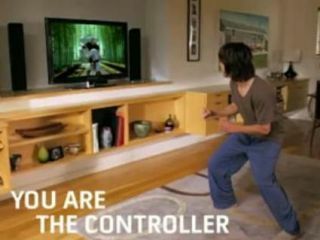 Natal is no mere copycat response to Nintendo's motion-control tech introduced with the Wii. And while Xbox certainly wants to make serious moves into the burgeoning casual market that's currently owned by the Mario factory, Natal's "controller-free gaming and entertainment experience" requires no controllers at all and is instead controlled by body movements, gestures, speech and pretty much any object you care to wave around in front of the telly. None other than Steven Spielberg turned up at Microsoft's E3 presser to sing the praises of this revolutionary 3D motion sensor that is set to overcome "the barrier of the controller". He told the assembled gaming hacks how he was "often asked how interactive entertainment could become as approachable as any other form of entertainment." The Hollywood director added: "The vast amount of people are too intimidated to pick up a games controller. 60 per cent of people do not own a video game console so the only way was to make the tech invisible and then they can shine in the spotlight. It's not reinventing the wheel, it's about no wheel at all." While many at E3 were worried that the technology might not work so well in a typically cluttered lounge environment, TechRadar managed to get some hands-on time and all such doubts and scepticism about the tech immediately disappeared. Our reviewer simply described it as "effectively having a motion-capture studio in one's home... it locks onto human bodies and tracks their movements in such minute detail, and with such responsiveness, that developers can use it to let players control their games with the tiniest of gestures." Microsoft is not only learning about disruptive technologies from the likes of Nintendo, it's also learning a lot about the art of the 'ultimate reveal' from Apple CEO Steve Jobs. Witness, for example, the company's sleekly produced drama that was the opener to E3 2009, Microsoft started with the two living members of the greatest band of all time on the stage (*cough* The Beatles) yet managed to trump even that with the "and finally" moment which was the revealing of Natal.